As soon as an employer takes on their first member of staff they have legal duties with respect to auto enrolment. This is known as the employer’s ‘Duties Start Date’. This guide is designed to give an overview of the ‘Auto Enrolment duties and spells out how Moneysoft Payroll Manager can help with the process. More detailed information including user guides for specific pension providers can be found on the Auto enrolment support section of our website. What do I need to do as I approach my Duties Start Date? Choose a Pension Provider: It is important to choose a good quality pension scheme that provides value for money and protects your staff’s retirement savings. There are many providers offering pension schemes suitable for auto enrolment. We would recommend that you begin the process of selecting a pension provider as soon as you know that you will be taking on your first worker. The Pensions Regulator guide ‘Choose a pension scheme’ is a good starting point. Moneysoft Payroll Manager is able to integrate with many of the major pension providers, including NEST, the government backed pension scheme. Assess your workforce: On your ‘Duties start date’ (and in every subsequent pay period) you should run an ‘assessment’ of your workers to determine who needs to be automatically enrolled into the pension scheme. Employees that are aged between 22 and state pension age with earnings at or above the ‘Earnings trigger’ ( which for 2019-20 is £192 per week / £833 per month) are classified as ‘Eligible Jobholders‘ and should be enrolled into your pension scheme. Employees that do not meet this criteria are classed as either ‘Non-eligible jobholders’ or ‘Entiltled workers’ and can choose to ‘Opt in’ to or ‘Join’ the pension scheme if they wish to do so (The qualifying earnings threshold for 2019-20 is £118 per week / £512 per month – see diagram below). Payroll Manager has an assessment report which will show you which employees fall into which category. Enrol workers into the pension scheme – Once the ‘Eligible Jobholders’ have been identified they need to be enrolled into your pension scheme. There are various methods of doing this, ranging from manual input on the pension providers website, through to data uploads from your payroll software. Payroll Manager is able to produce ‘upload files’ for most of the major pension schmeme providers and can communiacte directly with NEST, the government backed pension scheme. Communicate with each employee – You have a legal obligation to issue communications to your employees following the ‘Duties Start Date’ informing them of the actions you have taken following the assessment procedure. Some pension providers may produce these communications for you. Payroll Manager is able to produce standard letters for issue to each employee. Calculate and deduct pension contributions – The amount you must contribute to the pension scheme is determined by your particular scheme’s rules. 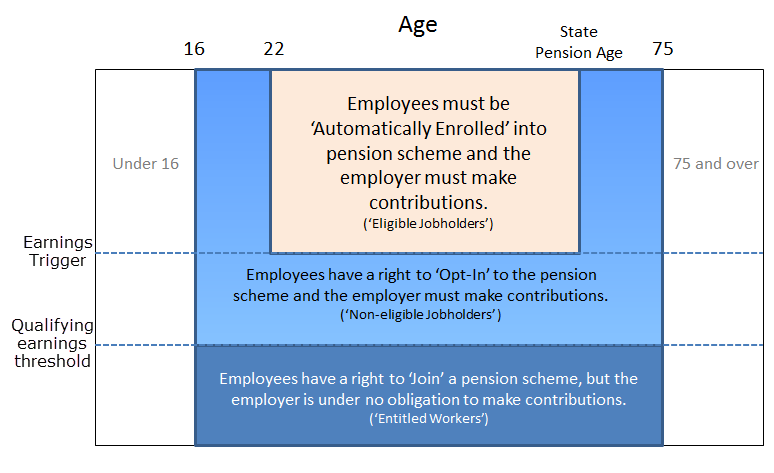 However, if you’re using the scheme for automatic enrolment there are minimum contributions you must pay. The current legal minimum contributions are shown in the table below. Once you have entered the correct percentages into the software Payroll Manager is able to calculate the employee and employer deductions automatically. The Pensions Regulator website gives detailed guidance on all aspects of automatic enrolment. The Auto Enrolment Support section of our website has a number of user guides for specific pension schemes.